Comfortable rural accomodation, between Rhayader and Llanidloes, perfect for walking.cycling, mounatin biking and outdoor activities. The bunkhouse will sleep a maximum of twenty people, and is available for groups or individuals, either self catering, or we can cater for you if booked beforehand. Upstairs is a dormitory sleeping up to 14 people and downstairs is a family room sleeping up to 6, with disabled access. The dormitory can be split into 4 separate areas with curtains. Please see the bed layout page for more details. 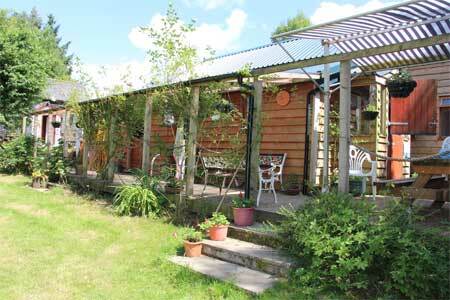 There is also a fully equipped kitchen, washing and drying room, common / dining room and of course toilets and showers. As most of our guests bring their own sleeping bags bedding is not included in the price, but duvets are available on request for a small extra charge. Please let us know when making your booking and we will have everything ready for you when you arrive. The bunkhouse is heated in winter. Outside there is a covered verandah and garden, along with a barbeque and charcoal pizza oven. The term 'bunkhouse' is used when referring to hostel type accommodation with dormitories, rather than individual bedrooms. Those who have walked in the mountain regions of Europe may be more familiar with the term 'mountain hut', 'gite d'etape', or perhaps 'refuge' or 'refugio' depending on the nationality and language. Indeed, with the owners having walked extensively in the Alps and Pyrenees, this would be our preferred term, and the Mid Wales Bunkhouse has been modelled on the high mountain huts found in the Spanish and French Pyrenees. These are warm, comfortable and equipped with the outdoors person in mind. By the very nature of the accommodation and visitor there is always a warm and convivial atmosphere where tales of the outdoors are exchanged and new friends made. 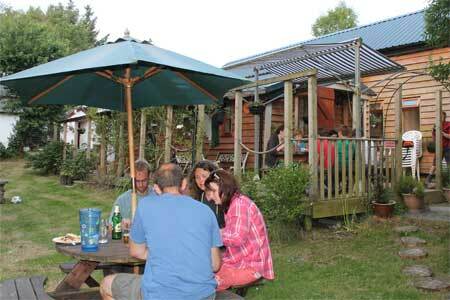 Check availability and book bunkhouse accommodation online. Please contact us if you wish to book the tipi, camping or caravanning. Combined bunkhouse and tipi offer. Specially discounted rates are available for tipi bookings included as part of an exclusive use bunkhouse booking. Due to the nature of the accommodation we regret that we are unable to accept dogs in the bunkhouse or tipi. Please bear this in mind when making your booking, and also please make sure that all members of your group are aware of this policy. Dogs can be accepted for camping and caravanning bookings provided that they are well behaved and under proper control at all times. Data from our own on-site weather station. Full weather station details can be found on the dedicated weather page. Please be aware that the accuracy of the data cannot be guaranteed, and no decision should be based solely on it. Whilst our accommodation is let on a self catering basis we are also able to offer meals, but these do need to be booked in advance. For a large group the more notice you can give us the better. For smaller groups and individuals the day before is usually enough. Indeed for individuals, provided you're happy to settle for whatever we have available, we can usually put something simple together in a couple hours. Peace and quiet and beautiful rolling countryside with a superb view from your window is what you will find on arrival at Woodhouse Farm, home of 'Mid Wales Camping and Caravanning', and this is confirmed by our Camping and Caravanning Club 'hideaway' status. The site is available to all Club members and any non members are welcome to join on arrival. A Tipi is the traditional tent of the native North Americans, as found on the plains of the 'Wild West' in the 1700’s. The comments below are a random selection taken from our visitors book. Wow! What a fantastic place. I've stayed in a few bunkhouses and this one is a 5* hotel compared to them. I will definatly be back hopefully soon. Comment left by James Hunt. Come over from Australia to backpack around UK. This is the nicest place I've stayed so far, everything was perfect and I would recommend! Great place, very homely, had an awsome time. Thank you. Comment left by Julie, Clare, Lorna and Simon. Comment left by Graham Hobbs. Thank you so much for having us at either end of our D of E Gold and Silver week. After 3 nights camping in the rain / midges we were glad to get back here for showers and proper beds!!! Comment left by Churston Ferrers GS. Very affordable stay. Great facility. Comment left by RAF Regt.